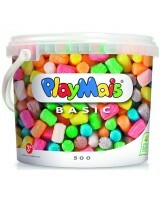 PlayMais®. A box full of creativity. PlayMais® is a natural, versatile craft material for children, which is 100% biodegradable and therefore harmless to the environment. It is made from maize, water and food colouring. PlayMais® sticks together with a tiny dab of water PlayMais® can be shaped easily with the fingers PlayMais® helps develop fine motor skills PlayMais® encourages creative thinking PlayMais® aids your childs creative development PlayMais® is educational PlayMais® is a natural product and is environmentally friendly PlayMais® is easy and fun Contrary to many toys currently in the marketplace, all development and production of PlayMais® takes place in Germany. 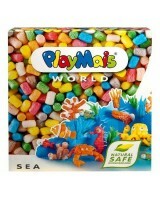 Furthermore the environmental sustainability of PlayMais® is not just a theory. It truly sets new standards for intelligent stewardship of the available resources of our planet!